In my foresight, I wisely did not promise to avoid posting recipes similar to each other this year. After all, having resolved to make more breakfasts and use more leftovers, I knew I would be spending many a morning with French toast. Not that I am complaining. Buttery-crisp on the outside, pillowy-soft on the inside, bathed in the syrup/compote/coulis/et al of your choice, topped with cream and/or fruits, smeared with nut butter or Nutella…It’s just the thing to have in the morning to set you right and make you believe in the intrinsic goodness of mankind. And it is the best way ever to breathe new and vibrant life into old, stale, depressed bread. I never throw bread away. Aside from being loathe to throw any food away (even writing “throw food away” makes me cringe), there are so many uses for those retiring loaves that there is really no need to. You can cube them and turn them into croutons for soups or salads. You can toast the bread, break it apart, and stick them in your food processor to make bread crumbs. You can make bread soup (sopa seca to my mum). 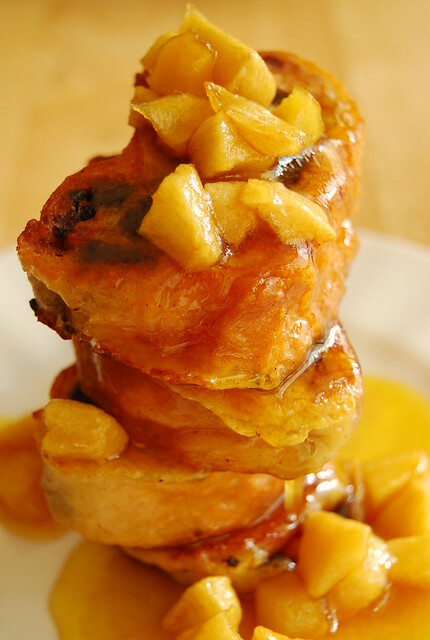 You can make bread pudding (still have to try my abuelita’s delicious recipe…soon!). And if it’s a dreary little morning that has you in need of a little cheering, and not much time or energy, you can make French toast. – Make the maple butter apples. In a skillet that will fit all the apples in one layer, melt the butter. Add the maple syrup and stir. Add the apples and simmer until the apples are soft and the sauce is sticky, stirring occasionally. This will take about 15-20 minutes. Set aside to cool. – Whisk the egg and milk together until they are fully combined. – Soak your bread slices in the milk/egg mixture for a half a minute on each side (I did mine in two batches). – While your bread is soaking, melt a pat of butter in a non-stick skillet. When the bubbles subside, place your bread on the hot butter. Cook until golden brown and toasty then flip and repeat with the other side. Remove from pan. – If your maple butter has separated just stir it vigorously until it becomes homogenous. Pour on top of your French toast with joy and abandon. Not much time? Yes! French toast is ridiculously easy to make, and provided you keep the accoutrements simple, can even be whipped up on a workday morning. Here’s what you do: the night before, have your bread sliced and ready in a flattish bowl in the fridge. Measure the milk out in a jar. The next morning, crack the egg into the jar, twist the lid on, and shake until incorporated (like making a salad dressing). Pour egg mixture into the bowl with the bread, heat a pat of butter in a pan, and you will be ready to get down with some French toast in minutes! Now, this recipe is not a work-week recipe. This is a Sunday morning recipe. A Sunday morning when you can take the time to enjoy the slow simmering of apples in butter and maple. When you can watch the glossy golden bubbles and smell the irresistible fragrance of melted butter, without worrying about unanswered emails and eye-numbing statistics. When you can nudge the apples into soft submission while reflecting on what is right in the world. The intrinsic goodness of mankind? Oh it does exist…especially over breakfasts like these. I think we could all benefit from a quiet morning with bread, butter and maple syrup don’t you? *I love using raisin bread for French toast! With no extra effort on my part, I have a ready-flavored French toast infused with raisins and cinnamon. The amount of slices will depend on the size/diameter of your loaf. Mine was small, a jelly roll shaped loaf of about 3 inches in diameter and 2 inches in height and I could make 8 slices with this recipe. If your using a big loaf with extra thick slices (as my aunt likes to do) this will probably be good for 2 slices. Anything in between would make, well, anything in between. My mother would love this as it combines her two favorite things: French toast and apple pie! Oh my goodness. Look at that stack of deliciousness! I have a half a loaf of store bought raisin cinnamon bread sitting in my fridge right now. I know what I am having for breakfast tomorrow morning now! Thanks for the inspiration. Really nice photo. My wife and I really love to have a nice brunch with one another on Sunday mornings. This recipe might have to be on the list of things to try. A bowl of maple butter apples alone would be marvelous. I think I need to go back to having french toast for supper just so I can make this. I love french toast, but I haven't tried making it with raisin bread yet but this looks so delicious! Hi 3748 Miles! Thank you 🙂 Let me know how it goes! Hi Sylvia! The apples would be great with other things as well…like ice cream or yogurt! Wow I just noticed your blog and I am so jealous I don't have a kitchen right now. I would probably be making this if I did. Sadly I live in a college dorm and will have to wait until I get back home to start cooking. For someone who is "terrified" of sweets for breakfast, I'm wondering where I can get good raisin bread so I can try this 🙂 looks absolutely delicious ! Hi Stephanie! Thanks for dropping by and leaving such a nice comment 🙂 Glad you enjoyed the post! Good luck with your degree! Hello Weekend Gourmet! Thanks! 🙂 A little sweet to start the day can be very good! What a fantastic looking breakfast. I think every bite of this would be delicious bliss. I have a linky party on my blog every Saturday called "Sweets for a Saturday" and I'd like to invite you to stop by this weekend and link this up. That opening picture is sublime. I just had lunch and I'm yearning for breakfast tomorrow. You've mentioned how you use leftover bread. Do you ever do bread salad? I've only tried doing it once and found it strangely soggy. Do you have any suggestions? Hi Michelle! Oooh! Hope you both like it! Dates are so delicious on their own! I ordered some from California and after the UPS man left them on my doorstep, my dog ate them all, and spit out the pits! you have revolutionized french toast for me. what i once deemed as soggy, egg-y, and gross now looks delicious, sweet, and interesting. thank you. i hope this is the beginning of a beautiful relationship for french toast and i.
Hi Speckle of Dirt! So sorry to hear that! now that's a beautiful, beautiful breakfast. This recipe was fabulous! I added a little bit of cinnamon to both the maple butter apples and the french toast batter… worked out great! Gave it a little hint of my mom's home-made apple crisp 🙂 Thanks so much! Delish!!! I WILL DO THIS!